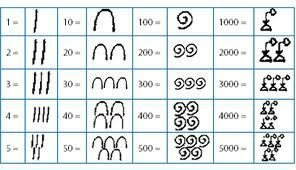 Likewise, Egyptians did not follow a numeral system like ours where there are 9 digits from 0 to 9 and bigger numbers are formed with these numbers. They had the unary system of Egyptian Numbers, common among ancient civilizations. In this system, a simple line meant one; two lines meant two, three lines three and so on. When it reached 10, a new symbol like an inverted U was used. A coil of rope was the symbol for a hundred. The symbol for a thousand is the lotus or water lily. It shows the leaf, stem and rhizome or root. A single large human finger symbolised the number ten thousand. The number one lakh was represented by a tadpole nearly turning to a frog. God heh or a man with both hands raised was the symbol for a million, sometimes used for infinity also. A symbol resembling a circle was again used to represent infinity because a journey through a circle never ends. Multiples of these values were expressed by repeating the symbol as many times as needed. As they did not have a concept of zero, there was no symbol for it. The system of Ancient Egyptian numerals was used in Ancient Egypt until the early first millennium AD. Egyptian Numbers and calculations were important to the Egyptians especially in the construction of Pyramids and monuments. They would have wanted to calculate the amount of labour, number of stone blocks, amount of food for the workers etc. Mathematics was also significant in measuring time, straight lines, the level of the Nile flooding, calculating areas of land, counting money, working out taxes and cooking. Egyptians knew addition, subtraction, some division and multiplication. They only multiplied and divided by two, so if they wanted to find ex 5, they would use ex 2 + ex 2 + e. 13 / 4 was done as 4 x 2 + 4 = 12, 13 – 12 = 1, and so the answer was 3 ¼. Being only able to multiply and divide by two, Egyptian math was unwieldy. To get whole numbers like 32, the Egyptians would have to write: 10 + 10 + 10 + 1 + 1. Although simple, the way the Egyptians wrote their maths made it long and repetitive. The Egyptian sign ‘gs’ was used for the word ‘side’ or ‘half’ ½. The word ‘hsb’ meant ‘fraction’. and represented plus and minus signs respectively. The Egyptians were somewhat familiar with both roots and square roots. The Great Pyramid of Khufu from the Fourth Dynasty was a mathematical wonder because it was laid out with geometric precision. The Egyptians also made the 365-day calendar, which again proves their excellence in mathematical skills. Though the Egyptian number system was unwieldy, it has to be accepted that they were one of the ancient civilisations who created wonders with numbers.